Response: The aim of our research is to study the importance of executive functions for successful behaviour. In our first study published in 2012 (Executive Functions Predict the Success of Top-Soccer Players) we showed that the level of elite soccer players’ higher executive functions was in general 2 standard deviations above the normal population. It was the same for both men and women. Moreover, we also found a strong correlation between the capacities of higher executive functions and the number of goals and assists the player made after two and a half year. In our new study we were interested in how the situation is at a younger age, from twelve to nineteen years of age. Because of the maturation of the brain, higher executive functions do not reach their full capacity before nineteen years of age. On basis of this, our question was whether there were other parts of the executive functions that correlated with success in soccer. In this new study, we focused on core executive functions like the working memory, as it reaches its full capacity in the early teens. We found that there was a moderate correlation with the accuracy of the working memory and the number of goals the junior elite players made during a period of two years. When we made a composite measurement of both the demanding working memory and the test for the capacity of the higher executive functions, we found a strong correlation between these results and the number of goals that the players made during the two years of time. When we measured IQ and physical features, like length, we found out that those did not influence the results. Response: First, the executive functions are strong predictors for specific behaviours. In a lot of different sports the focus is on the athletes’ physical and technical abilities. From the result in our studies, it looks like the importance of cognitive aspects as executive functions are underestimated. 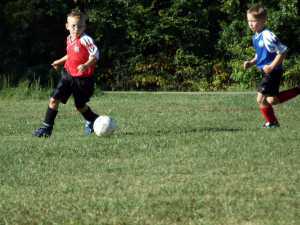 The second thing is that many sport academies select the players when they are very young. Physical advantage can make the trainer blind, so that they only select the players that are tall and strong. These players will be more successful in the beginning. However, when they reach sixteen and seventeen years of age, most of the smaller players have grown up and if this is combined with higher executive functions, they will outcompete the players who earlier were more successful because of their physics. There is a risk that too hard selection built on physical advantage in younger age, in the end will screen out potential superstars. Thirdly, IQ and physics are overrated when it comes to predicting behaviours. Response: Focus on successful profiles for specific tasks and roles. Response: Now our research team will go into other areas than sport. We will look on different occupations, management and leadership to find out if the executive functions also are significant for success in these areas. This entry was posted in Author Interviews, Exercise - Fitness, Karolinski Institute, Mental Health Research, PLoS by Marie Benz MD FAAD. Bookmark the permalink.